A former solicitor general has said Baroness Butler-Sloss should step aside as the head of an inquiry into allegations of historical child abuse. 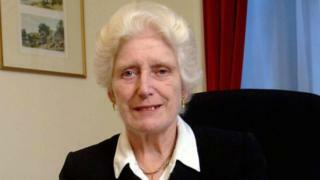 Vera Baird, a Labour ex-MP, said her appointment by the Home Office was an "error that needs correcting". The former High Court judge is under pressure over her links to the political establishment in the 1980s, when her brother was attorney general. The Home Office has insisted she is the "perfect person" for the role. However, ministers have said the inquiry panel "would draw on the right experts", amid suggestions that a co-chair with the same powers could be appointed to work alongside Lady Butler-Sloss. The 80-year old, appointed last week to head a review of how allegations of abuse linked to public institutions in the 1970s, 80s and 90s were handled, has faced calls to step down because of her family links. Her detractors point to her late brother, Sir Michael Havers, having been attorney general at the time of the alleged organised abuse that is the subject of her review. Lawyers representing alleged victims of child abuse have also questioned her suitability. Labour has also stopped short of giving Lady Butler-Sloss its full backing, saying the Home Office must take note of public concerns and structure the inquiry in the "right way". Ms Baird, who was the government's second most senior law officer under Gordon Brown, told BBC Radio 4's Today she was not disputing the peer's track record or her credentials for the role. But Ms Baird, who is now police and crime commissioner for Northumberland, said the problem was that the peer was linked through her family "to the very establishment that this inquiry is being set up to look at". She said: "She is going to have to investigate the role played by her late brother." Media captionAbuse victim: "Butler-Sloss the wrong person"
Although Ms Baird had "no reason" to believe Sir Michael was ever given any information relating to alleged child abuse, the fact that he would have been responsible for dealing with it should be enough to disqualify his sister from taking on the role. She added: "The current issue is should somebody be investigating something in which their brother has been named, however much in due course he may be exculpated? "Is this going to satisfy this very vulnerable company of people who feel the establishment has kept them out of justice already?" Ms Baird said that if Lady Butler-Sloss were sitting in a court of law under such circumstances, she would have to recuse herself - the term for when judges excuse themselves from a case because of a potential conflict of interest or lack of impartiality - when her late brother was referred to. She added: "I don't know if she, when agreeing to take it on, knew the implications for herself and her family... The error is the home secretary's and it needs correcting." Ms Baird suggested that some of those making the decision may have been unaware of her connections to Sir Michael, who was attorney general between 1979 and 1987. But Sir Matthew Thorpe, a former lord justice and senior Family Court judge, said Lady Butler-Sloss would have been "manifestly conscious" of her own family connections and the impact they would have on the role. He told Today: "The idea that the prime minister was unaware of the fact that she started her career as Elizabeth Havers seems to me highly improbable." Lady Butler-Sloss was "supremely qualified" to head the inquiry, he added, because she had "unrivalled interdisciplinary expertise" in child protection and public policy as well as the law. "Listeners may think she is a judge and only knows the law but that is far from the reality... She does have experience of all aspects of child protection." He said it was not necessarily the case that she would have to stand aside if such matters went to trial. Although a handful of Conservative MPs have raised concerns about Lady Butler-Sloss, the vast majority have said she is the right person and should be left to get on with the job. But questions have been raised about the peer's report in 2011 into child abuse in the Church of England, with one victim claiming she had "shown bias" and was not "impartial". Phil Johnson, who was abused while a choirboy, claims Lady Butler-Sloss wanted to exclude some of his allegations in an attempt to protect the Church of England - claims that have been rejected. The Home Office has said it was backing her "unreservedly", adding that she was "beyond reproach". A spokesman said: "Her work leading the Cleveland child abuse inquiry and as president of the High Court's Family Division make her the perfect person to lead this important piece of work."